It ain’t free, but be sure to check Grayhawk’s “specials” to take advantage of deals offered periodically for golf, dining and entertainment, special events and catering, instruction and merchandise sales in the Golf Shop and Trading Company. Better yet – Click Here to be the first to know about new special offers at Grayhawk Golf Club. Book a Last Minute tee time up to 3 days in advance and save on your next round. 24 Hour cancellation policy applies to all tee times. 36-Hole Specials must be booked directly through Grayhawk’s Golf Shop at (480) 502-1800 and the two rounds can be spread over five days if needed. Twilight rounds begin three and a half hours from sunset and will not finish 18 holes. The acoustic jam on Quill Creek Patio is back featuring live performances by Jay Allan and Matt Henderson along with drink and appetizer specials running the gamut from Grayhawk’s signature Grande Margaritas to savory prime rib sliders. 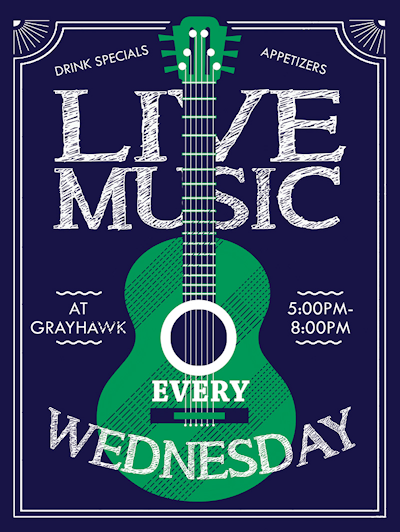 Live at Grayhawk will fire up every Wednesday evening, weather permitting, through the cool season. Music starts at 5:00pm and rolls along until 8:00pm where you can sip and sing along to a variety of favorite cover tunes while overlooking the Raptor course and the McDowell Mountains. Seating is first-come, first-serviced, so get on it early.